Please retype the anti-spam code "8115"
845,591,700,000,000,000,000 × Global GDP in 2015, and again multiply × all one second per one year. Capital Fund is a STOX of State market and the Bank Divided possession's value. The Capital Fund is First Level of Bank Fund's management. The Administrative body for The Federal Market is Central Bank of Federation (CBF). The CBF have a right to use Administrative Department's for administrative action. Administrative Department is CBF employment together with division for control-ship mechanism. The CBF have a right contract the special service for Administration of Bank activity, if the mechanism of Service Administration is active under verified system of the protection and control-ship in trust. Creating a Board of Directors from staff over international sources of job seekers. The CBF interactively calculate value of the currency and under strategy of market is currency limited. Limitation of currency don't can establish effect of lack source for civilization or risk on financial crisis. The CBF active registry all evidence with a currency action or financial exchange. The CBF primarily use two type of currency, "Diamond DMD" for inter-state market, and "International Diamond IDMD" for International Market connection. The CBF develop a Fund's of Bank, under the purpose of active need's for effective function, administration, state development and currency strategical stabilization, Fund's is registry with their Level Category of Bank Fund's management, divided on the IDMD and DMD capital value. The Fund's can by activated together with sub-funds under flexible strategy of capital manipulation. Infrastructure of Fund's is permanent without limited date, infrastructure of sub-fund's is flexible, with a limited date according management of operation strategy. Central Fund of The Bank, Capital fund. Great Day Dear Customer's, Client's, Business Alliance People ! Our Economy is based on Multi-value, The Multi-Economy. Registration of Legal Values, Sources and Material's, Active Gross Domestic Production, Legal Development Project's and price of Mandate, and also Bond's of Debt's claim's for re-compensation. Today in the terrorist blockade, we have a register of Development project's for period of 20 year's from a time of the 1998 year, and therefore also a claim of Bond's of Debt's for re-compensation. Because, we are is in the blockade, we don't have ability for calculation a value of our economy of Domestic STOX calculation, Project's of Development and a Bond's, according real statistic with a influence by the world economy and prices on our market, because terrorist blockade don't allow us start business development in foreign countries when therefore world market and economy for last 20 year's lose on own level of value, when our standard goal of development is global growth in all states around the world, into the minimal level equal on a norm of most advanced state economies in the world, The United States of America, Japan Empire, France republic, German Federal republic, Chinese Popular republic and advanced states. Terrorist blockade don't allow us, openly contact all states in the world, don't allow us obtain official confirmation on governmental interest in their development strategy, and their interest on our partnership, we therefore don't can calculate the value of real claim of states and the claim of level of International market, when we don't have opportunity for calculation of the influence of International prices on our national economies of federation. Therefore, we can calculate a value of our economy only according the values of today current International price and such level of influence into the federal market of our states. Standard level of influence of International Market into the Federal prices, is a level when a Federal Prices for a source material's, consumer good's, and product's can rise up on price in the level of 7× minimum according process of own state pricess growth, and therefore in a time when our Political Board is stabile, we can only contact other states in the world, and therefore obtain our connection on Judicial process for re-compensation, also the right for activate the development according the process of claim's, and grow the world states economies on minimal norm of today most advanced states. Currently, our re-calculation on Federal Prices value is expand the level of the 7× because we also use system of Inter-state process of growth which have internally autonome influence on pricess and market, when we is therefore forced for use the strategy of Internal Currency regulation and stabilize active trade or prevent agians't economic cris, deflation or inflation effect's or capital competition's between institution's. We also know, our economy can have a dominant position value agains't any state in the world, also most dominant level of value than the economy of whole planet Earth, and also we are therefore again reconfirm, our interest is together internationally coordinate and support, primary establish business connection between states and open our common business relation which allow for a states, their increasement on greater value which therefore lose on the level of opposition agains't dominance, and therefore we are have also confirmed, We are is not risk of economy dominance agains't any state in the world, bud also we again confirm, we are support business development only between the states which is legal, peaceful and active under legitimacy principles without terrorism or crime, meanly without criminal opposition agains't us, the Imperium of Diamond's Federal government. The value of economy have also correct validity, and in time, when we can contract between nation's and institution's on International level, we therefore can again reconfirm the value of the currency under real norm and claim all right of such re-compensation for terrorist blockade and consequence. Our calculation on World Economic lose by the terrorist blockades and such consequemce, is a level of World Annual Economy, minimal theoretic value in the norm 936,492,375,000,000 $$, it is therefore 7,688× more than today world annual economy. The loses created by the terrorist consequence is therefore recognized as a loses valuable than value of today world ! The project's of development, is a registration claim on the development per period time of 20 year's, since 1998 when our country is declared on legal statute by the recognization on the right for action and such claim. The Development Project's is a registered as Business Mandate for commercial action available for strategical sale invitation and allow for foreign and federal companies their participation in the development, therefore the Development Project's, according the statistic's, and process of analyze the civilizational growth increase on value of state economy which is under evidence in the Central Bank of Federation and government ministries, for the opportunity on claim the currency, author right of banknotes and cheques, and also such limitation on their value according the growth stabilization and strategical exchange. The Financial value of ID's currencies is standard normalized by the principles of regulation in Bank Administration and allow us development of the strategical opportunity for currency regulation. In case of the inflation on the market price, the Bank use own capital for scrab a financial values and therefore active stabilize the currency, or print new banknotes for ability of the currency minimize on the price if the market rise on own values and STOX. The Federal Bank don't have interest for change the value of currency, our strategy is stabile investment price according the strategy of the currency management and administration. In time when our stox is growth up, we print new IDMD banknotes, and in the time when our market lose on value, we scrab a reserve finances in CBF Administration Fund ownership. The price is active stabilized for a period on more than 10 year's. One of our strategy is also form of Division Register of Project's, in a need for planing reserve Development Project's which we can use in the need's of catastrophes, financial crisis, currency value lose or level on international currency competition, therefore we can immediatelly strength our market stox and currency value under the determined norm's. Today we use Dual currency strategy, DMD is point's of Internal State market which allow us the practice of independent space for financial regulation and growth without limit on dependences of International investment and foreign influence on our economy. IDMD represent International banknote which is use for International payments and financial cooperation, regulated under the value of DMD currency, and administrate only for International relation's of business. The Federal Bank have a right for own determination, in which financial currency DMD & IDMD will by Cheque exchange. The Second Level of Bank Fund's Management is strategy of the International Currency "International Diamond, IDMD", on the value registered according the STOX of value on the DMD Third Level of Bank Fund's Management. The IDMD Second Level of Bank Fund's Management is established for the administration of Third IDMD Level of Bank Fund's Management, and actualy consist from IDMD Bank Fund for limitation finance, IDMD Bank for Administration of Active and Public finance in International Exchange, IDMD Government Operation, and IDMD Reserve Operation Fund. IDMD Bank Fund for limitation finance, is fund with a Financial division of all coins in active validity, open for active use and public distribution or scrab on value according strategies of currency limitation and the regulation of currency value on the point. IDMD Bank for Administration of Active and Public finance in International Exchange, is a fund of the Administration body in sector of Active operation's of Finance in public, political or civil ownership of international society, the Account's of Bank's Client's, Investment Fund's and Operational Fund's for action in the International Political or Civil commercial infrastructure, or active finance in International public use, also evidence of foreign ownership and financial deposit. IDMD Government Operation Fund, is fund for strategical budget planing of Governmental Action in the International relation, and fund use stabile opportunity for control-ship of Political Activity and Financial exchange according the agreement's of contract's and business operations between International bodies. IDMD Reserve Operation Fund, is fund for financial stabile capital and possession's which is use for debt prevention, minimizing risk of catastrophes in special situation's of Financial Crisis, and also for the strategical ability of the re-stabilization of government and market active infrastructure in case of Financial or Political Crisis. Economy of Special zones and entities. Third Level of DMD Bank Fund's management is the Bank Fund for limitation finance, Fund for Bank's Possession, Bank for Administration of Active and Public finance, and Reserve Operation Fund, The Government Fund. Second Level of Bank Fund's Management scheme is under evidence in currency of "Diamond, DMD". Bank Fund for limitation finance, is fund with a Financial division of all coins in active validity, open for active use and public distribution or scrab on value according strategies of currency limitation and the regulation of market prices. Fund for Bank's Possession, is a fund for registration of all legal possession of bank, properties, investment properties, financial certifications, cheques, bond's and valuable contract agreement's, own valuable deposit in administration of another institution's. Bank Fund for Administration of Active and Public finance, is a fund of the Administration body in sector of Active operation's of Finance in public and civil society, the Account's of Bank's Client's, The Fund's of Commercial Bank's, Institutional Fund's, Investment Fund's and Operational Fund's for action in the civil commercial infrastructure. Reserve Operation Fund, is fund for financial stabile capital and possession's which is use for debt prevention, minimizing risk of catastrophes in special situation's of Financial Crisis, and also for the strategical ability of the re-stabilization of market active infrastructure in case of Financial Crisis. 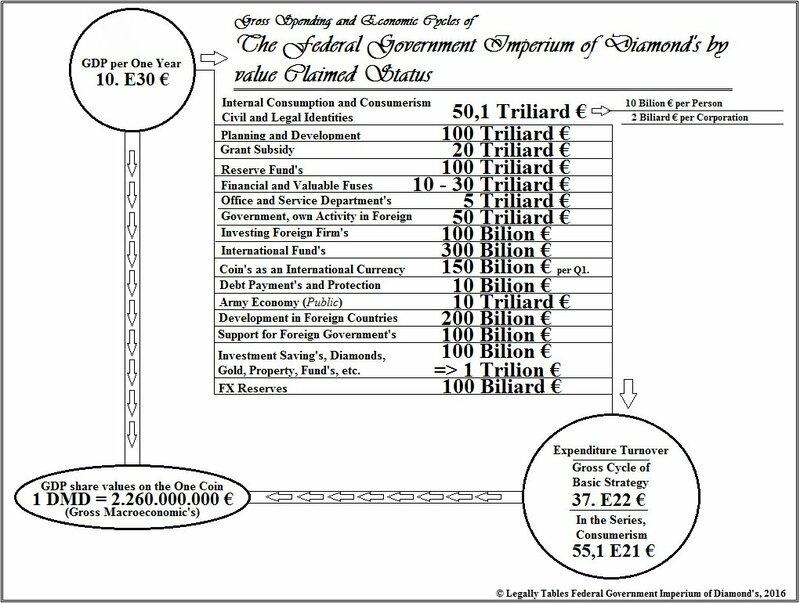 The Government Fund, is a fund of the governmental budgetary plan and center of all governmental and political operation's with a finances and legal values. Bank and Government have a strategy for evidence the Fund of Division Property, the property active under administration of Bank and active evidence, with the independent value register from State STOX and Market, Currency value of State Coin's. The CBF have a right for print and limiting the Share Paper's in evidence of their registered value according the value of Division Fund and CBF strategy of Share Paper's limitation. Every Fund have own strategical use and purpose of establishment. The fund's is administrated by the Bank Administration bodies, together with a Ministries of Federal Government, in the strategy for their categorical relation for a ministries and governmental department's or Institution's. Foreign Institution together with CBF have pre-agree on the system of legal verification of transaction of the capital in finance or statistic re-calculation. The CBF interactively inform all partner institution's on DMD and IDMD currency market value. The CBF use Cheque system, Telex or another available and agree method for transfer of Legal Value of Currency Point's and capital, and transfer the Statistic data of Administrative Verification for active International Financial Transaction coordination. ID's Cheque Account is drawn paper with certified value. The Cheque obtain name of cheque owner, cheque Identification data, and value of the Cheque in currency. The Cheque Administration Office, registry the Identity of Cheque acount owner, Name, Date of Birth, Citizenship, ID Card identification codes, Postal and contact code of living place, active contact's, also is available establish Special Registration process by the 3D Biometric Scan register of Face, Eyes site, fingerprint's, radio wave scan of body and another option's. Special registration process is available for special fee. The Cheque Administration Office registry all identification data and verified the value of the financial amount of Cheque Acount together with controled identity of Cheque Acount owner. The Cheque Administration Office, write the value of Cheque inside a Cheque document, and dually write the date, number of Cheque in code of line management of Office, and the Official Number of Office in the CBF registry, in write note inside of Cheque, and Administrative book of Office, The Secretary Book of Office. The Cheque Administration Office must control authenticity of a data of drawn Cheque, together the Data registered in the Secretary Book of Office, and therefore according the data from Secretary Book again control the identity of Cheque owner. When Cheque owner is adequately control, than Cheque Administration Office can accept new Cheque Application for exchange owners of cheque, exchange values between cheques, or exchange acceptable financial value for a value of Cheque, value of Cheque exchange on acceptable Financial value. The Cheque Administration Branch copy all Secretary Book's every one Day, and send the copies to The Administrative body of The CBF. Central Bank of Federation consolidate all evidence of Cheque manipulation's, registry all operation's, and Administrate the process of currency limitation, also distribute the Central data of verification for all owner's and applicant's of the Cheque Acount's user's on all Cheque Administration Branch, for active opportunity for control-ship of Cheque values and their certified owner's in a need for writte new Cheque or exchange and safe. The Cheque Administration Branch is managed under CBF, and registered on the Central Book of General Secretariat for Administration office of CBF. The CBF establish the branches in the Federal territories, for opportunity on the active building of the trade and open opportunity for open exchange. The CBF establish foreign Cheque Administrative Branches by agreement with foreign states on a Right of own CBF Office development, or in contract transaction between federally active commercial bank's under jurisdiction of CBF and connection with their foreign branches, and also with available option of agreement on transaction cooperation with foreign bank's which accept the transaction partnership. Institution of federation or foreign states and countries, active as a Transaction body for Federal or International Finance and Cheques Exchange or Operation must open the Cheque Administration Office, for opportunity on the stabile Cheque's transaction's and opportunity of the finance active exchange according the process of the Prosecutor connection in data interactive transfer and verification. Public exchange and write new cheques on the name of client's and value owner's. The Cheque Administration Office registry the Identification Code of Capital Cheque send from CBF, by writing a codes to the Secretary Book of Administration, and according the interactive state of Capital Cheque Value, and interactivelly under operation's registry all statute written in the Secretary Book after writing a new Cheques and exchange, and re-calculate the current values of Capital Cheque source. If The Value of Cheque will by recognized as falsified in consequence of foreign or internal body and move in crime, the criminal body will have a legal responsibility for the re-compensation from all damaged values and posession's or the development lose. If The Value of Cheque will by recognized as falsified in consequence of foreign or internal body and move in crime, the Central Bank of Federation must use every available option for immediately stabilization of all consequence and values of Cheque Account's, their validity and opportunity for active use.